Seconds before i started trying to post this page the site was working perfectly normally. The moment I started doing something it began acting up. I have every intention of doing something about it after I finish the page tonight. Remember, for uninterrupted updates go here: Backup Site. I’d go with Heart just so I can mind control people into saying Heart is awesome. Though more than likely I’d pick fire. SECOND!!!! sorry. i have never been second! i am excited. and BTW this panel for today looks different. Better different. i cant place my finger on it, maybe its the characters poses, IDK it looks Great today. Hey, first time commenter, I like the comic a lot. Very funny, very well written, just a blast. That said, I would find it incredibly amusing if you just turned it into a comic devoted solely to ripping on Ma-Ti. MWF: Ma-Ti Jokes. I think you’re underestimating my ability to rip on Ma-Ti. I haven’t even gotten to the ad hominem yet. I’d take heart. not originally, mind, but after a few years of thinking about it. Heart is the ultimate villain power. Hey, you got money? I don’t. Have a HEART and hand it over. Oh, you want to take me to jail for all those things I did? C’mon, have a little change of HEART. Okay, so it’s not as flashy or obvious as the others, but in the hands of someone truly diabolic it is genuinely dangerous. And, I suppose a clever, subtle good guy could have some use for it as well. Me, however… I’d have a loyal army of heart-washed minions willing to die for me. And a grotto. But only because grottoes are awesome. That is a truly awesome idea. Meh, only if the animals would want to spy for you. I’d have someone come up and say how much B.S. 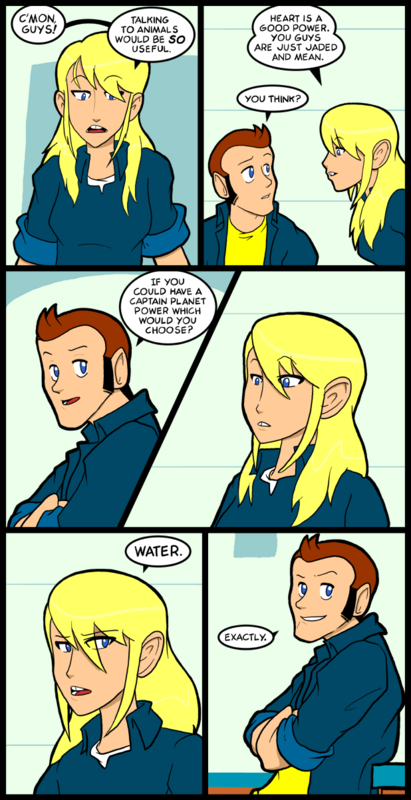 the water power was in Captain Planet. If you remember in the show, Gi could only use water if there was a source of water around. Wheeler had fire shoot out of his ring, Linka made wind shoot out of hers. Ma-ti has his heart thing. Kwame always had earth around to move with his power. Gi was useless if they were inside a room without water. My guess is that if Wheeler was the leader of the group instead of Kwame. He’d have the planeteers split up ala scooby doo with wheeler and linka as a group and kwame, Gi, ma-ti as the other group. Ma-ti is shaggy and his monkey is scooby doo. Being from south america he had the marijuana hookup. Heart is an awesome power. It’s just… in the hands of a pansy. If I had the Heart power, I’d be unstoppable. Mind control, you say? Yeeeah… let’s just say it’s a very good thing–for the rest of the world–I’m not a Planeteer. It’s the inverse law of lethality and utility. Heart would be incredibly useful in most situations, except against the Big Bad from Captain Planet. After all, the Fire guy can burn people, but the Heart guy can call an army of Bears, Wolves, Tigers and Eagles to fight for him. I’d still go for Wind, because that’s my element, but I’d take Heart as a second choice. I’d probably go with fire, just cause it’s awesome. Plus, it’s the only one I have a vivid recollection of. On a side note, that little gap in Ninas teeth is really cute. with her ears it makes her look like a monkey. Mmmmmm I would have a hard time picking from fire,water,earth, or wind on there own there much more fun in combos. fire+wind=fire storms and fire tornado’s go with wind+earth sand storms and such so ya I would have a hard time just picking one but if I had to ehhhhhhhh I would have to go with ether Wind or Earth as you can do the most with those two thats both non-fatal and fatal mehehehe. Use Heart to mind control the other planeteers. It would be like having all five at once. Ma-ti is is the x-men’s Jubaliee. I’d leave all five of them alone and go with earthbending. Toph and Lin Beifong are teh awesome.